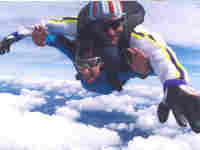 An experience designed to provide you with an almost immediate introduction into the world of skydiving. After a pre-flight briefing designed especially to inform you of everything that you need to know you will be fitted with a comfortable adjustable harness. Now you are ready to experience the exhilaration of freefall. Upon entering the plane your harness will be locked onto one of our highly experienced British Parachute Association tandem instructors. You will jump from around 10,000 feet above ground level allowing you to experience the exhilarating feeling of freefall for about 30 seconds. Falling at approximately 120 miles per hour, with breathtaking views of the surrounding countryside, the instructor will then deploy the main parachute. Then from here you will glide down under a large square parachute made specifically to comfortably carry two people safely to the ground. Video of the jump avaiable as a lasting memento to show your frinds and prove that you did it! Applicants under the age of 18 years will require the consent of a parent or guardian. If you are aged over 40 years, a medical form signed and stamped by your doctor is necessary. Forms available from the Club.